Charring veg on the barbecue adds a whole new level of flavour. 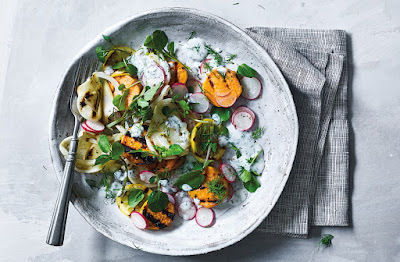 In this barbecued salad, fennel, lemon and soft slices of sweet potato are transformed after a few minutes on the grill and finished with a light buttermilk dressing for the perfect vegetarian barbecue option or hearty side dish. a sharp knife. Meanwhile, light the barbecue and wait until the flames have died down, or preheat the grill to high. 30 secs. Arrange on a platter with the radishes and watercress. In a small bowl or jug, whisk together the buttermilk, olive oil and lemon juice. Season and stir in 1 tbsp dill. Drizzle the dressing over the salad and scatter over the remaining dill and the fennel fronds to serve.